If you’ve ever tried taking pictures of dogs, then you know it’s hard to get a good shot. Dog photography takes a little patience. But even amateur photographers like you and me who just want to take better pictures of our dogs can do these simple things to improve our dog photos. Avoid green eyes (similar to red-eye in humans) by not using the flash. Instead, use natural lighting whenever possible. If you simply must use a flash, make sure you’re aiming from the side and the camera isn’t aimed directly at your dog’s eyes. 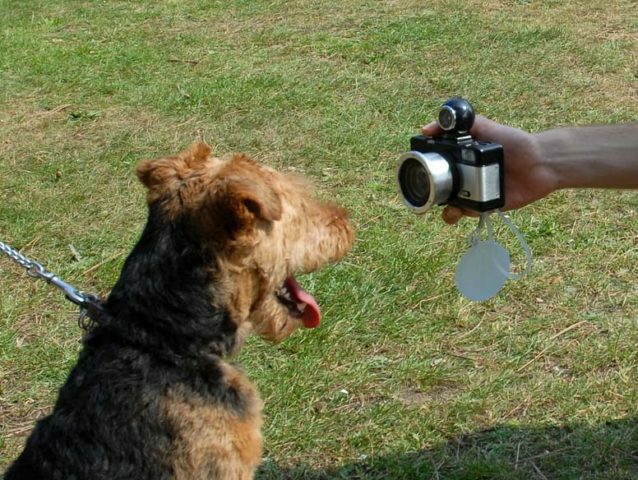 Take pictures at your dog’s level, rather than always standing above with your camera pointed down at your dog’s level. Without a doubt, the more angles you experiment with (2-3 feet off the ground, directly above your dog, directly below your dog, from the back, from the side, or from some other angle), the better your dog pictures will be. Use the continuous shooting mode whenever possible. Don’t wait for your dog to do something cute, then get into position to take the shot. Instead, shoot even when it seems your dog isn’t doing anything interesting. Those are sometimes the best shots — because you’re able to capture a sudden movement that your dog makes! The best photos are when your dog is completely relaxed and just being a dog. The candid shots are the most natural, best dog photos you can take. Posed shots are good too sometimes, but more as the exception than the rule. If your dog simply won’t sit still long enough for you to snap the photo, try taking photos when your dog is tired, lazy, or sleepy. Your dog shouldn’t always be right in the center of the photo. In fact, the best shots are when your dog is off to one side in the photo, or you’re zoomed way in for an extreme close-up of one aspect of your dog (like an ear twitch, an eye wink, a tail wag, or a head twist). Zoom is a wonderful thing. Be outside in natural light whenever possible. The best time of day to take photos outdoors is an hour or two after sunrise, and an hour or two before sunset. And never shoot directly into the sun. You want the sun to be behind you. Basically, you want your dog looking toward the sun! The color of your dog’s fur has a lot to do with the quality of your photos as well. For example, I have black dogs and I can’t tell you how many times my dogs get lost in the background of my few shots. It’s because their black coats simply blend into dark backgrounds. The same is true with white dogs in front of light backgrounds — especially snow! For the most part, you want your photos of dogs to capture the color and texture of their coats. That’s what turns a good photo into a great photo! So, the next time you take a picture of your black or white dog, glance around and see what is going to be in your picture first. Either choose a different background deliberately, or wait until your dog is positioned in front of the appropriate color of background. That way, you won’t lose your dog in the picture! A black dog should never be photographed against a dark background. A white dog should never be photographed against a light-colored background. You always want some contrast between the color of your dog’s fur and the color of his surroundings. It’s also difficult to get good dog photos in the snow when you have a white dog or a black dog. Usually the dog will become washed out, or the snow will look grey instead of white. Here are some tips for photographing dogs in the snow.